The nervous system is collection of specialized cells responsible for coordinating activities in our bodies. Nerves are vital components of our nervous systems, serving as links between the environment and our brains. Nerves are made up of thousands of tiny fibers called axons which are bundled together like cables, known as fascicles. The cables are insulated and protected by a thin sheath, called the epineurium. Nerves have important motor and sensory functions. “Motor nerves” carry signals from the brain to the muscles. The signal causes the muscles to contract. “Sensory nerves” carry information about the environment back to the brain such as touch, pain, pressure, temperature, and vibration. Some nerves, called mixed nerves, have both motor and sensory functions. Nerves are fragile and can be injured by many different causes — including compression, lacerations, or blunt trauma. Compression of a nerve is caused by prolonged pressure placed against a nerve, such as carpal tunnel syndrome. Nerve lacerations are often caused by a sharp object such as a knife or broken glass. A nerve can also be injured by a sudden forceful strike, known as blunt trauma or a “contusion”. Depending on the particular nerve injured, a patient may lose sensory function, motor function, or both. How is a nerve injury diagnosed? Nerve injuries are diagnosed based on history and physical exam. Injuries to the blood vessels and tendons of the hand are also important to diagnose. In some cases, an electrical study (NCS/EMG) can help better define the injury and assess the recovery of the nerve. A cut nerve in the finger or thumb will make it very difficult to feel the tip of the digit. Tingling and electric pain are also common symptoms with nerve injuries in the hand. What are the treatment options for a nerve injury? Treatment of a nerve injury depends on the patient’s medical history, severity of the injury, timing of the injury, and specific nerve involved. Nerves which are contused (due to blunt trauma) or stretched will often recover function gradually on their own, if the nerve injury is not too severe. Nerves which are cut in two (transected) will probably not recover function unless surgery is performed. Without surgery, the two ends of the nerve have difficulty joining together. Depending on the loss of function and patient desires, surgery may be recommended for a transected nerve. When a muscle loses its nerve supply, it loses power. The muscle will slowly deteriorate and decrease in size over time — a process called “atrophy.” After 12-18 months, the muscle loses the potential to recovery function, even if the nerve supply is reconnected at that time. In these cases, the lost muscle function can be substituted by transferring another muscle or tendon in its place. This is called a “tendon transfer” and is discussed with patients with functional loss from a motor nerve injury. What is involved with nerve repair? The surgery is typically performed on an outpatient basis using either regional anesthesia or general anesthesia. During surgery, the nerve ends are brought back together and the nerve sheath, or epineurium, is repaired using fine sutures. This is called a “primary repair.” Surgical magnification improves the ability to see the nerve and its tiny internal bundles (fascicles). Injured tendons are also repaired if possible. Autografts: An autograft is a nerve taken from the same patient from a different location in the body using another incision. Allografts: An allograft is a nerve taken from a deceased donor. There is a very small risk of both virus transmission and graft rejection with use of allografts, but they do not require a second incision on the patient. Synthetic tubes: Synthetic tubes are manufactured conduits designed to guide the reconnection of nerve gaps. They are beneficial because they do not require nerve harvesting from the patient. They are not as effective as autografts in large nerve gaps. There is a small risk of graft rejection with any synthetic material. Large gaps in a nerve are treated with either autografts or allografts. Small gaps in a nerve can be treated with autografts, allografts, or synthetic tubes. 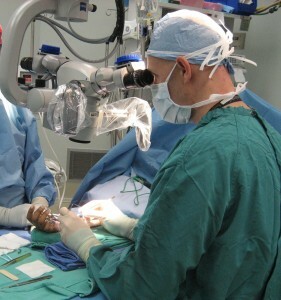 Here is a picture of the operating microscope often used in nerve repairs. What can I expect after nerve repair? After the surgery, your hand will be immobilized in a plaster splint to protect the repair. The splint will be removed in our clinic after a few days and a removable splint will be made for you. Most patients can begin to use their hands for light activities after about 3 weeks. Pain, swelling, and stiffness in the fingers gradually improve slowly over time. Sometimes therapy helps if the fingers and joints become stiff during the treatment. Nerve repair surgery is not a “quick fix.” Recovery of the nerve is very slow and can take 12 months or more. Recovery time varies among patients, depending on the severity of the injury, patient age, possible complications, and medical history of the patient. The best results from nerve repairs are observed in young children with sharp-cut lacerations. Poorer results are seen in elderly patients with severe crush-type nerve injuries. Most patients are somewhere within this spectrum of injury. Nerve injuries have challenged even the most skilled surgeons for decades. Repair techniques have advanced over the past few years and outcomes for patients have improved. Nevertheless, many people do not regain 100% nerve function after nerve repair. However, my goal is to help each patient obtain the best possible result after this significant injury.